What a fantastic week for the crypto enthusiasts! Bitcoin and the total market capitalization both gained more than 30 percent this week. Is this the start of a new bull market or just a belated April fool? To find out, let’s have a look at the technical analysis of Bitcoin, Ethereum and the total market capitalization. Bitcoin broke the major resistance between $4200-$4500 which is extremely bullish. 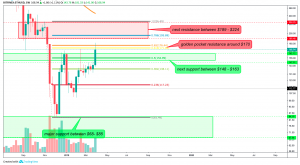 Currently sitting at $5112, there is nothing which holds Bitcoin back from rising to the $5500 range, where Bitcoin faces multiple resistances, such as the golden pocket fib extension level and the 50-week-EMA. Once broken, the re-test of the $6000 mark is overdue. 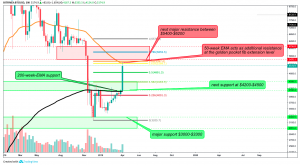 In case of rejection of the $5500-$6200 regions, Bitcoin finds its next support at around $4200-$4500, where the 0.382 fib extension level and the 200-week-EMA act as additional support. Thus, everything above the $4200 mark remains bullish. For now, Bitcoin’s outlook is indeed very bullish and we might see no retracement before reaching the $5500 resistance. Ethereum bullishly broke the resistance between $148-$163 which now acts as strong support. The weekly candle is currently slightly below the golden pocket extension level, which must be broken before we see a re-test of the $200 mark. In case of a heavy rejection of the next resistance, Ethereum finds additional support at the $138 mark, where the 0.382 fib extension level is located. The cryptocurrency market bullishly broke out of the downward channel last week and surged all the way up to the major resistance at $180b. 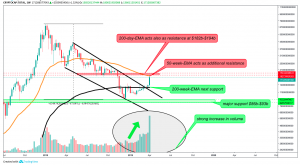 In fact, the overall cryptocurrency market faces resistance around $178b-$192b, where the 50-week-EMA and the 200-day-EMA act as additional resistance. In case of a bearish rejection, it finds its next support at the 200-week-EMA around $130b. Once bearishly broken, the cryptocurrency market finds its next major support between $86b-$93b. However, the strong increase in volume is indeed very bullish. To conclude, the bigger timeframes indicate bullishness and bullish months might be ahead. However, we need to break the major resistances before we can assume the start of a new bull market. While the technical analysis looks extremely bullish, one has to exercise caution with placing long positions, since a short-term retracement should take place very soon and, as long as the major resistances are not broken yet, it still could be a major bull trap. Yet, the market is very bullish and both BTC and the total market capitalization have around ten percent room to the upside before a retracement is likely to appear. Once the major resistances are broken, it seems likely that the market has bottomed out and we won’t see new lows. 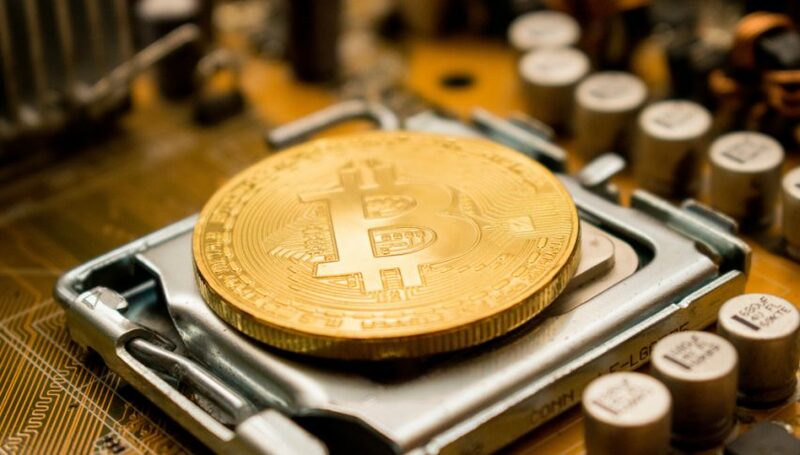 With the current outlook it seems likely that the bear market might have come to an end, given the fact that the cryptocurrency market has declined more than 87 percent from the all-time-high already. Lambda, which gained by 122 percent. The major news of this week was that Vitalik Buterin has reportedly urged South Korea to deregulate blockchain and that Ripple, Swift, Cardano, IOTA, ConsenSys and the EU are launching a joint Blockchain network called INATBA.